There are all sorts of productivity and project management tools out there available to use online these days, but Trello is a favorite among many. If you work with a team in an online environment, or if you're just looking for a more effective way to stay organized, Trello can definitely help. Read through the following Trello review to find out more and decide if it's the right tool for you. Trello is basically a free tool, available on the desktop web and in mobile app format, that lets you manage projects and collaborate with other users in a very visual way. It's "like a whiteboard with super powers," according to the developers. A board represents a project. Boards are what you'll use to organize and keep track of all your the ideas and individual tasks that make up that project via "cards." You or your teammates can add as many cards to a board as necessary, referred to as "lists." So, a board that has several cards added to it will display the board title, along with the cards in a list format. Cards can be clicked on and expanded to view all their details, including all the activities and comments from members, as well as a range of options to add members, due dates, labels and more. Have a look at Trello's own board of templates for ideas that you can use to copy to your own account. The Layout Reviewed: Trello's incredibly intuitive visual design gets an A+ from most of its users. Despite how many features this tool has, it maintains an incredibly simple look and navigation that doesn't overwhelm — even for complete beginners. The board, list, and card framework allow users to get a big picture view of what's going on, with the option to dive deeper into individual ideas or tasks. For complex projects with lots of pieces of information and potentially many users working together, Trello's unique visual layout can be a lifesaver. Trello lets you easily search for other users from the Menu so you can start adding them to certain boards. Everyone who has access to a board sees the same thing in real time, so there's never any confusion about who's doing what, what hasn't been assigned yet or what's been completed. To start assigning tasks to people, all you have to do is drag and drop them into the cards. Every card has a discussion area for members to comment or even add an attachment — either by uploading it from their computer or pulling it directly from Google Drive, Dropbox, Box, or OneDrive. You'll always be able to see how long ago someone posted something in the discussion, and you can even leave an @mention to reply directly to a member. Notifications always enable members about what they need to check. Collaboration Reviewed: Trello has its own social network, calendar, and due date checklist built right into it, so you'll never miss a thing. Trello also gives you complete control over who sees your boards, and who can't by either making them public or closed with selected members. Tasks can be assigned to multiple members, and notification settings are customizable so users don't need to be overwhelmed with every little action that takes place. Although it's highly praised for offering a collaborative online environment that's easy to use and highly visual, it does lack in some feature offerings when you try to dive deeper into lists, tasks and other areas where you want a bit more control. The possibilities are endless. If you can plan it, you can use Trello. If you are still unsure if Trello is right for you, here's an article that explains the how someone would use Trello for real-life tasks. Versatility Reviewed: Trello truly is one of those tools that can be used for really anything without any limits. Because you can add everything from photos and videos to documents and text, you can make your boards look exactly the way you want and fit the type of content you're looking to organize. The tool's versatility gives it a leg up among other comparable options, many of which are designed to be used either specifically for collaborative work or for personal use — but often not both. Trello gives you a wonderful bird's eye view of all your projects, which is great for giving users some peace of mind with regard to understanding how each task and project ties in together, seeing what the most important things are that need to get done and getting a glimpse at who's responsible for what. It's all about the visuals. The mobile app is also incredible. Trello offers apps for iOS, Android, Kindle Fire and Windows 8. We'd highly recommend using them. Some users have expressed concerns about its slightly limited feature offering when you try to get right down to the very detailed nitty gritty stuff, which is probably why some workplace teams turn to Podio, Asana, Wrike or other platforms instead. Slack is another one that's quite popular too. If it weren't for this, we'd likely give it five stars. When comes straight down to it, it really is a matter of personal preference and how you plan to use it. 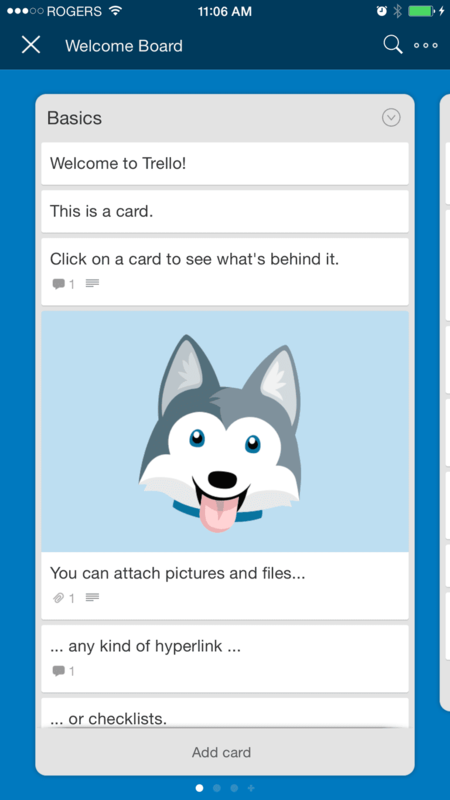 Try using Trello for organizing projects and ideas. It offers so much more than a regular list-building app or a Pinterest board.